SD2Vita is an exciting niche for anyone interested in the mechanical assembly of PCBs because it touches on what most of us love: PS gaming. Primarily, SD2Vita is just a micro SD adapter inserted into the standard Sony PS Vita. However, it adds some charm with its ability to offer more memory for gaming. Thanks to the advancements made in SD2Vita; gamers can now extend their external memory storage to about 256GB. Then again, the SD2Vita's hype doesn't go without a few issues. As manufacturers of PCBs, we have noted a spike of problems related to this technology. In this edition, we brought together different views that could help you survive in manufacturing SD2Vita PCBs. We also tried to showcase the critical SD2Vita hacks and tricks that you need to possess when using the adapters. If you want to know more about how to use the Eagle to design please see Eagle PCB Design Full Version. Are you ready to roll? Well, let's get started. As already highlighted, SD2Vita is a Micro-SD adapter that is designed for use in a regular PS Vita game card slot. The SD2Vita adapter allows gamers to use the standard micro-SD card rather than Sony's PS Vita memory card. At the moment, SD2Vita comes in either version 3.0 or 5.0. Also, these adapters run on the standard PS Vita firmware (version 3.60 or later). Because of this compatibility, you don’t have to scratch your head, again and again, trying to find the compatible software accompaniments. The Play Station Vita (PS Vita) is a portable, hand-help play station console that was produced by Sony in 2011 as part of their larger plan for the 8th generation of Video games. This device became famous for its ability to move PC gaming experience onto a portable device. SD2Vita is a memory card adapter that is designed to be used by the PS Vita card slot instead of the proprietary Sony Game memory card. Because SD2Vita is compatible with Sony’s firmware, everything else about it is all set. There are also other additional vendor software applications that make modern gamers to prefer SD2Vita over the Sony's proprietor cards. These factors lead us to our essential question: why should you consider going the PS2Vita way? 1.2 Is SD2Vita For Me? As we shall observe towards the later chapters of this edition, SD2Vita has awakened incredible community support and popularity among gamers in the modern times. Consequently, the increase in polarity has pushed the demand for SD2Vita adapters which directly dictates an increase in their production. Moreover, when the output of particular PCBs increases, it then becomes of interest to PCB engineers. SD2Vita adapters allow players to make use of their own ordinary micro SD cards as opposed to Sony's proprietary PS Vita micro SD. At the moment, these adapters support up to 256 GB of storage space. Because of this, gamers can quickly increase their storage space by buying standard Micro SD cards with more storage capacity. Look. I find PC games more interesting the more freedom accorded to me. For instance, there was a game I adored so highly because it allowed me to drive virtual cars like crazy and make accidents like I was acting in some "Fast And Furious" movie. Moreover, then came a different one that allowed me to shoot like a freaking terrorist. Ooh boy! Gulp. Those were my ideal games. Besides the freedom to break the rules in the gaming environment, I also fancied the ability to run the game on multiple devices with different computing ability. That was my (personal) view of an ideal computer game. However, when checking through other gamers, I noted that most of us as players share a similar taste of "freedom." Now, think about it; would gamers love to be tied to using only one type of hardware? (I guess they don’t.) Isn’t it the nature of players to try out whatever is new and exciting? SD2Vita shifts the attention of SD storage from the Sony’s standard cards and allows gamers to adopt cards that suit their preferences. This aspect now allows more PCB designers to be crafty and smarter to woo more sales. Though the cost of SD2Vita adapters keeps changing, these adapters have proven to be cheaper to buy when compared to the regular Sony Micro SD cards. Of course, there is always a tradeoff with this reduced price as some of the adapters may be incompatible with some PS Vita gamepads. Even so, most of them are above the bar. However, then, our question was: is SD2Vita for me? Well, honestly, there is no fixed answer to this question. To most people, the idea of adopting new technology is often met with some doubts. However, maybe through good study and comparison of the advantages explored, you will be able to conclude whether you will, or you won't go with the SD2Vita technology. If you feel like you might want to adopt it, then I advise you to stick around for the next few chapters as we explore the installation and a few hacks of the technology. Though the advantages of using SD2Vita somehow outdo the cons of adopting the technology, there is more to installing the PS2Vita adapter than meets the eye. This process involves three main steps: determining the version of SD2Vita adapter, formatting the storage micro-SD card, and installing a few software applications. Before we set to the process of installation, let’s first check out the requirements of setting up a new SD2Vita adapter. 1. The PS Vita HENKaku Enso Firmware: Ensure you download the appropriate PS HENKaku firmware for the SD2Vita adapter. At the moment, it could be recommendable to opt for versions later than 3.65. Also, consider checking through our “Tricks and hacks” section for a collection of other vendor applications like AutoPlugin that could be helpful during installation. 2. 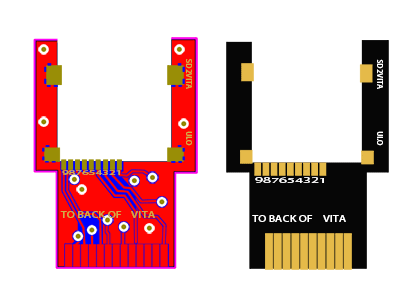 The SD2Vita adapter: Also you will need to order for a few SD2Vita adapters. At the moment, the two main versions of SD2Vita are version 3.0 and version 5.0. Due to their popularity, these two versions have broad community support from gaming forums. Because of this fact, you are often likely to receive aid whenever you get stuck using these adapters. Also, as I had noted from the beginning, SD2Vita still exists as a blue ocean without much competition but prone to constant and frequent improvements. The later versions (SD2Vita v3.0 and v5.0) are better materials than their predecessors. They are also able to support more vendor applications and tricks that can make gaming more interesting. 3. Micro-SD card(s): you will also need to have a standard micro-SD card for storage of game and setup files. SD2Vita supports up to 256GB. 1. Move the UX0:tai folder into the UR0:tai folder and delete the original UX0: Tai. The UX0:tai folder allows you to use the SD2Vita adapter once the vita card gets inserted. The UR0: Tai, on the other hand, is the folder that acts as the internal memory of the Vita for slim FAT models and PSTVs models. This step is therefore critical as it helps to eliminate the path-related complications when you begin to use SD2Vita. 2. Download SD2Vita adapter drivers from Github. 3. Download The zzBlank.img File. 4. Copy the “gamesd.sprx” file (included in the SD2Vita adapter drivers) into the UR0:tai using the VitaShell through USB. 5. Open the “config.txt” file in UR0:tai. Now add the text “ur0:tai/gamesd.skprx” immediately after the line with the word *KERNEL. 6. Make a backup of the UX0:tai folder in your computer. This step is essential as we will require it in the preceding stages. It is also necessary as you may encounter installation challenges in the later steps and might need to repeat the steps from the very beginning (if you don’t make the backup now). Also, if you are operating through the VitaShell USB, it is advisable to ensure that all the hidden files are visible before making the backup. 7. Now install the zzBlank setup into your Micro-SD card using the steps guidelines below. 1. Download an appropriate Windows disk imager like the Win32 Disk Imager. 2. Install the set up in your computer and run the application. 3. Choose the option of making a new disk image. 4. Select the zzBlank.img that you downloaded earlier as the source for the setup and your micro-SD card as the disk, then click "write." 5. Hang on for a few seconds for the file to be written. 6. Once you are done, eject the micro-SD card and return it. 7. Windows will prompt you to format the drive. 8. Format the drive with the exFAT File System. 9. Once done, copy the backup files for the card we had made earlier into the micro-SD card. 10. Now insert the SD card back to the SD2Vita adapter and insert it into the PS Vita, then reboot the PS Vita. 2. Copy the memory card backup we had made before into the SD card. 3. Insert the SD card back to the SD2Vita adapter and insert it into the PS Vita, then reboot the PS Vita. 1. First, locate the whole-device node in “/dev/” directory. For instance, it could be labeled as “dev/sda1”. When you are uncertain, use the “mount” command. Be sure to replace the “sda1” with an appropriate label. 2. Unmount all the partitions without ejecting the Micro-SD. 3. Copy the zzBlank.img file into the SD card in the terminal. E.g. “dd if=/path/zzBlank.img of=/dev/sda1”. 4. Eject the micro-SD card and insert it back. 5. Format the SD card using exFAT. E.g., you can type the following in the terminal screen "mkfs.exfat /dev/sda1”. 6. Copy the file backup you made earlier into the micro-SD card. 7. Insert the SD card back to the SD2Vita adapter and insert it into the PS Vita, then reboot the PS Vita. 3.4 Congratulations. You've Finally Made It. At this point, your Vita should be able to recognize the SD2Vita adapter you inserted. An orange LED next to the adapter should repeatedly blink once you have inserted the file as an indication that the PS Vita is reading the files in the micro SD. Additionally, you should observe that the SD2Vita adapter is now mapped to UX0. If these two indications are shown, then it means that your installation was successful. At this point, feel free to install more vendor games and install them on your PS Vita as you wish. You have successfully learned how to set up the SD2Vita adapter. Now to run any new vendor games, you will only need to mount them in UX0. However, there are times when issues of navigation and game compatibility may arise. In the next chapter, we will look at some of the tricks and hacks that can make your experience with SD2Vita worth of remembering. When using SD2Vita adapter, most vendor games are installed and run on the UX0. As you might have noted from the installation process, we shifted the default storage from UMA0 to UX0. Now, there are times that you would love to peek into the UMA0 storage. This step is often limited to rebooting your PS Vita and choosing the storage as UMA0. The Switch2SD2Vita is an excellent plugin that can enable you to switch between UMA0 and UX0 without rebooting easily. There are sometimes that your PS Vita might fail to recognize or run the plugin. In such cases, we advise that you consider an updated version of the plugin (Version 2.0 is the latest release of the plugin) and retry it. If it fails still, then you might have to remove micro SD card from the SD2Vita adapter. This plugin is advisable as it is open-source. Because of this nature of the plugin, it has been used by several gamers and addressed several bugs. Thus, it currently stands as the market’s stable and secure plugin. For newbies to SD2Vita, the ocean is always blue with several plugins that you can use to install applications. However, most of the plugins sometimes fail to work. This experience can sometimes be very frustrating. HENKaku’s AutoPlugin is the ideal plugin for installation of games. AutoPlugin loads with HENKaku (version 3.6 or later). As such, it is easy to locate and use. It is recommendable over the games-plugin for installing games. Like I had insisted in the beginning, gaming is only fun when you do away with restrictions: when you have absolute freedom to break a few gaming rules. This plugin will allow you to get around the DRM protection on PS Vita content. Of course, there other favorite plugins (like MaiDump and Vitamin) that perform tasks related to the same job the NoNpDRM plugin performs. However, we recommend this plugin as it is free to download and use (open-source). Also, it has undergone several updates to ensure its stability and safety when used. Even though the app does not require you to install Enso, it is recommended that you install it alongside the plugin. To install this plugin, you need to download the NoNpDRM setup files into your Tai folder. Next, you will need to update the configuration file “config.txt” file within UR0:tai under *KERNEL with the appropriate name of the setup file, e.g., adding "nonpdrm.skprx." As I had indicated from the very beginning, the SD2Vita niche is a relatively new niche in both gaming and PCB development. But SD2Vita is a recommendable improvement as it grants gamers the ability to extend the amount of external storage space they can utilize for gaming at a lower cost. The technology also offers players the freedom to explore more games and generally makes the gaming experience exciting. Now, when analyzing this trend (as a gamer rather than an engineer), I can observe an increasing trend in the popularity of SD2Vita over the proprietary Sony SD-cards for PS Vita in many gaming forums. This popularity can also account for the increased complaints of poorly developed PCBs for SD2Vita adapters. Now, just like any new technological advancement, SD2Vita was bound to face a few challenges from its onset. Sure enough, it has suffered several problems in the past, and it is still likely to face more in the coming days. However, we have also strived hard to ensure that we now manufacture advanced PCBs for SD2Vita adapters. Also, you can order them at a bargain here. In this edition, we have strived hard to gather and compile some of the challenges we believe may be facing most gamers and questions that most sellers of SD2Vita adapters are facing. Even so, we think you might still have more worries about SD2Vita adapters. Feel free to contact us, and we will take time to respond to your fears. Also, just in case you might need some other PCB printed boards, please feel free to reach out to us for a quotation.